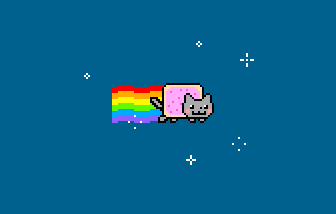 and the nyan cat saga continues! Clickable link: http://www.alternative-system.com/specific/emu/jteo/nyanCatTO8.htm. Press the "B" button on the right hand side and wait for it to load. Most obscure platform yet? :) Not much of a technical achiement though, AFAICT. But, I am obliged to thumb it up. rulez added on the 2011-12-10 18:02:35 by ɧ4ɾɗվ. Everything has to be done with the cpu (graphics and sound), the demo uses a 14187 Hz sample, a byte of the sample is send every 70 cpu cycles. Reminds me of my unfinished implementation. Perhaps I'll finish it for TUM. cool, production on those machines makes me happy. longue vie au TO8 ! TO8 really deserve lots of productions. vivement un carte son quand même. page created in 0.042938 seconds with 15 queries.